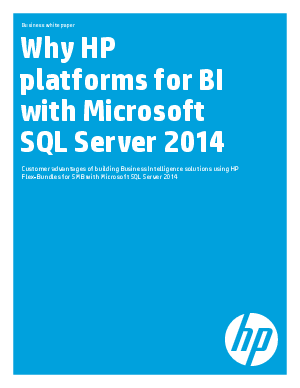 The HP Flex-Bundles for SMB with SQL Server 2014 were created to include everything that a business needs to easily build a new environment or upgrade an existing one. The following sections cover the server, storage, networking and services building blocks that make up these pre-defined configurations. HP Flex-Bundles are built on the HP ProLiant servers that include some of the latest and most powerful Intel processors. In designing the latest generation of the HP ProLiant server families, HP wanted to not only draw on 24 years of server experience, but also gain from the depth of knowledge and insight from customers.